Miles Davis said of the saxophonist Charlie “Bird” Parker that the sign of his genius was his ability to play “between the notes.” In a similar fashion, the power and originality of the sculptures made by Maro Michalakakos lies in the spaces—the absence that is created in between the concrete or rendered forms. 511 GALLERY is pleased to present the first U.S. solo-exhibition of the work of this young Greek artist, who mines fairy tales, dreams, and parables to make objects of sexual and political enigma. 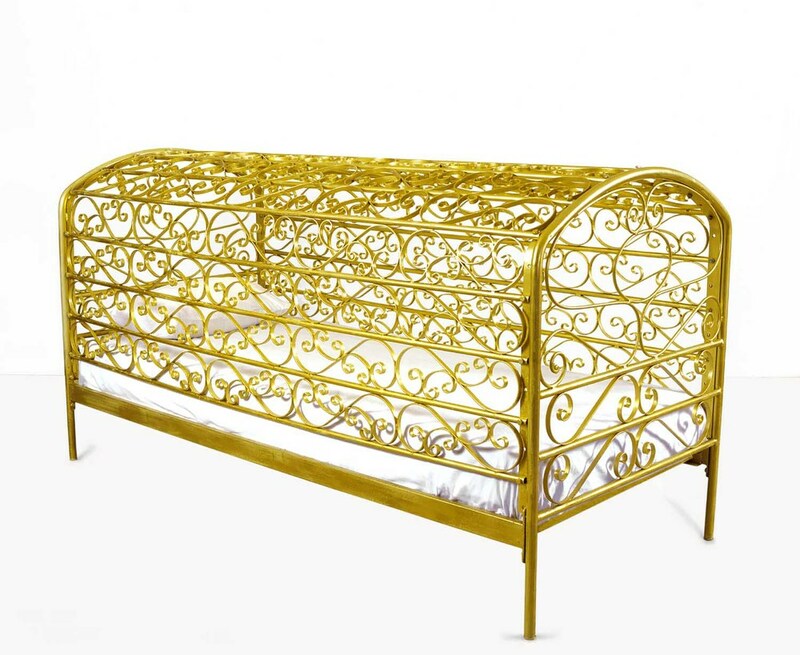 Allerleirauh is a gold, painted crib of forged metal, measuring approximately 6 feet by 3 feet by 4 feet in height. Delicate golden scrolls have been worked in between the spaces left by ordinary crib railings, and the entire bed—made up with sheets and pillow—is completely encircled by its ornate design. It is, in fact, a fanciful “cage”, but a cage nonetheless. The title refers to a Grimms’ fairy tale, the story of a beautiful princess with golden hair whose father, the King, sought to marry her after his own wife’s death. Even if we do not know this strange story of a child seeking to avoid incestuous relations with a father, Michalakakos’s crib directs us to consider an underbelly of dark urges, disturbances that reside in the spaces left “open” in an object’s making. Untitled is a spare but lifelike drawing on white paper of the Italian Prime Minister Silvio Berlusconi, sketched frontally, with his arms outstretched in what might be read as a gesture of inclusion, welcome, or pleading. The figure’s hands, which reach the edges of the paper, are foregrounded and “made” of shaved velvet, with fingers outlined in dark, black ink. In between the two hands is empty space, the lines of a human torso faintly ending in suit lapels above the place where a human waist would be, but is not. Michalakakos makes objects of wood; a round, Victorian oak dining table, with carved “hands” reaching from each end towards the center, where the table is left open, waiting for its leaves to be inserted; and from materials, such as lace and velvet that, on the one hand, suggest the work of women and can be read as feminist, but on the other connote royalty, wealth, and the influence of classical culture and civilization. In all cases, however, the work leaves spaces and gaps in between the drawn figures, the forged furniture, and the sewn and carved objects. This emptiness between lines and materials seems, ultimately, to be the place where the work’s meaning dwells. Maro Michalakakos was trained at the École Nationale Supérieure d’Arts de Cergy Pontoise (France) and the School of Fine Arts in Braunschweig, Germany. She has exhibited widely in her native Greece, at the Gallery Patricia Dorfmann in Paris, and at FIAC and the Fondation Deutsch de la Meurthe, also in that city. The artist lives and works in Athens.